Terms – All plants are labeled true to name, alive, healthy and dormant. Only healthy plants of excellent quality are shipped. Since we do not have control of the plants after they leave the International Bonsai Arboretum, plants are not guaranteed. Payment – Full payment must accompany all orders. All prices are payable in U.S. dollars and subject to change without notice. We accept checks, Mastercard and Visa. Please provide your account number and security code on the back and expiration date for credit card payments. New York State residents add 8% sales tax. Minimum order $35. Shipping & Handling – FREE SHIPPING Bare-root seedlings are only available from mid January through March 2019 by mail order depending on quantities and weather conditions. Plants will be shipped via U.S. Mail. Please provide your complete street address and telephone number. No foreign orders. Special arrangements can be made to deliver plants to bonsai conventions that I will attend. Please indicate preferred shipping date. Care Upon Arrival – Plants should be unboxed upon arrival and kept in a cool dark area at 35-40oF . Deciduous bare-root seedlings can be easily kept for several months if correctly stored and periodically checked for watering. Transplant when buds are swollen and before they start to open. Tap roots and heavy roots should be lightly trimmed when planting to encourage an abundance of fibrous roots. Seedlings should be potted before foliage opens and matures. We will over winter the plants and ship to you in early spring by zone hardiness, unless you request an appproximate date desired but shipping will also depend on weather condition. We ship on Mondays an expect package to arrive by Friday. Order early to reserve plants and avoid disappoinment. Available from early Febuary to end of March. Indicate date and add to cart. Japanese black pines are one of the finest and easiest pine species for bonsai training. They are vigorous with dark green needles which quickly reduce in size with the correct trimming techniques.These pre-bonsai specimens have been container grown and the trunks have movement, perfect for a workshop. The branches are well placed and can easily be wired for shaping. The root system has mycorrhizae (white symbotic fungus) which creates a healthy vigorous specimen. Last year’s growth has been bud trimmed so the needles are already shorter than normal. These Japanese black pine pre-bonsai are ready for serious development into fine bonsai and can be potted into display pots. pre-bonsai– 1 gal, 8-15” $110 Free Shipping! Great for club workshops or classes on pine bonsai! Larger image depicts the single sample tree after wiring and potting. Smaller image depict First individual sample tree was wired. More sample trees. Trees are not sold wired. Ceramic pot not included. Sargent juniper, also called Shimpaku juniper, is a favorite among bonsai artists from beginners to master artists because they don’t have a natural growth form and can be shaped into any shape. The evergreen, bright green foliage of the Itoigawa sargent juniper is more delicate and refined than the common Shimpaku juniper. They are quick to develop and easy to maintain. Supple branches can withstand quite a bit of bending into extreme as well as delicate forms. These specimens started from cuttings have been wired to create basic trunk movement and have been container grown to ensure a healthy root system. Create your own bonsai with bright green foliage! pre-bonsai– 4” pots, 8-12” $50 Free Shipping! Larger image depicts sample tree before wiring. Smaller image depict sample trees after wiring. Sekka hinoki cypress are rare in this country. They have a compact growth habit which are excellent for small and shohin bonsai. Thefoliage is tight and must be thinned out to find the branches. Very winter hardy, this plant is also becoming a popular with dwarf conifercollectors. These pre-bonsai Sekka hinoki cypress are single trunk, quite bushy and can be easily pruned, wired and shaped into impressive bonsai during a three hour workshop. A few older larger specimens which were stock plants for cuttings are available for pick up only or delivery to bonsai conventions. Great for club workshops or classes! Good for workshop and classes! Click on smaller images to see image of pre -Bonsai. Larger image depicts a developed bonsai, ceramic pot not included. There are several cultivars of Japanese maples with interesting bark. The most vigorous and easiest to grow and train for bonsai is the Rough Bark Japanese maple cultivar ‘Arakawa.’Truer from cutttings, many of these seedlings have shown the characteristic rough bark at a young age. These seedlings are from my forty year old garden which is covered with rough bark and has survived severe winters in Rochester, New York. Each seedling has been root pruned to encourage surface roots and wired to create trunk movement. Branches will quickly develop. The bright autumn color is reliable for these choice seedlings established in three inch pots. Click on smaller image to view seedlings. 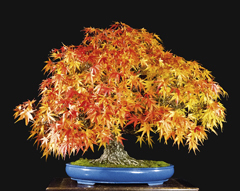 The Trident maple is one of the best deciduous species for forest and single trunk bonsai. The small, dark green trilobed leaves turn yellow and orange in autumn. They grow quickly in trunk caliber and thin, delicate twigs are attractive in winter when the structural beauty of the bonsai can be enjoyed. The unique ability of Trident maple roots to grow together and “web” makes it the finest species for root over rock style. New shoots grow quickly from old wood after drastic pruning. Flexible slender seedlings great for thread grafting roots and branches. The larger specimens are great for workshps or larger forest. Develops superb surface roots! Click on smaller image to view seedlings bundle. There are numerous cultivars of Japanese flowering quince, mostly selected for flower color and form. The Chojubai Japanese flowering quince is highly prized for the small flowers and rough bark which develops with age. Usually they begin flowering from late autumn to spring. The orange-red cultivar is well known with dark green leaves, but slow growing and difficult to find in this country. The white cultivar is even more rare and is much faster and easier to grow than the red variety. The white flowers are commonly followed by small yellow fragrant fruit which contrast well with the light green foliage. Most of these plants have been traind to be single trunk bonsai. Try this rare plant with white flowers! pre-bonsai– 1 gal, 8-12”– $65 Free Shipping! Click on smaller image to view Pre-Bonsai. The Koto Hime Japanese maple has probably the smallest foliage of all maples and is superb for shohin bonsai as well as larger specimens. The tiny foliage leafs out with a reddish color which becomes rich green. These plants are cutting grown and established in 1 gallon pots. Surface roots quickly develop from cuttings and develop heavy trunks when container grown. The natural growth habit for Koto Hime Japanese maple is upright, so horizontal branching needs to be shaped with wire. Short dense shohin bonsai can be developed in a few seasons with this easy to grow select cultivar. Add this small treasure to your bonsai collection. Click on smaller image to see Pre Bonsai sample. Larger image depicts a developed bonsai , ceramic pot not included. Unlike the common Japanese maple, these select seedlings which are dwarf in plant character with short internodes with dense twigs. The young new leaves of these Japanese maples have red edges when opening. During the summer small light green leaves provide a cool feeling, while autumn brings bright red and orange foliage. These trees have been field grown to develop trunks and twigs for two years and are excellent for workshops. Well branched with short internodes, small leaves and ready for bonsai pots. These trees were field grown to develop trunks and one year in a pot to develop twigs with trimming. An unusual Japanese maple for your bonsai collection! pre-bonsai– 1 gal, 18-20”– $90 Free Shipping! The Japanese Beauty Berry has brilliant small purple fruit from autumn through spring which sparkle in the sun. The light green leaves surround the light purple flowers during the summer. The small fine twigs are great for training shohin or small size bonsai. These fast growing seedlings have been trimmed several times in preparation for bonsai training to develop a compact shape Branches are easy to wire and the plant grows vigorously. Imagine a purple fruiting bonsai in your bonsai collection. pre-bonsai– 5” pot, 8-10”– $55 Free Shipping! Japanese red pine are excellent but are difficult to find species for bonsai training. The bark forms thick sections which add the appearance of age quickly. The trunks are reddish as are the buds. The light green needles, thick bark and growth characteristics are different from Japanese black pine. Japanese red pine are delicate in appearance, but easy to grow and are winter hardy. Short needles are easily developed. The three year old unbranched seedlings, have a good root system and can be easily bent to look old and contorted. Easy to grow and winter hardy! 3 Tree Bareroot Seedling Bundle- 5-8” Tall Free shipping! Unlike the “true” Redwoods native to California, the Dawn redwood, native to China, is a deciduous conifer which is quite winter hardy in northern areas of the United States. The delicate appearing foliage appears to be feathery and is bright green in spring. Autumn brings a bronze coloring before all the foliage drops revealing branches. This fast growing species develops quickly with rough bark adding impact to the bonsai design. Although most bonsai are trained in the formal upright style, any upright form is suitable according to the growth charcteristics. Forest plantings are popular if different size trunks are available. Make your own Redwood forest. Larger image depicts a deleloped bonsai forest, ceramic pot not included. Dwarf stewartia (a member of the Camellia family) are grown for the light-brown, cinnamon-colored bark, small white flowers, bright orange autumn foliage and distinct long dormant buds. The fine twigs also make Dwarf stewartia an excellent choice for shohin bonsai and for winter appreciation. Often displayed in winter to appreciate the unusual beautiful bark. Difficult to find outside Japan. These vigorous seedlings have light branching and a fibrous root system which make them excellent for forest bonsai. A true rare find in the bonsai world. 1 Bareroot Seedling - 12-20” Tall– SOLD OUT! Hinoki cypresses are prized for their elegant fern like dark green foliage which lies flat. This slow growing cultivar is popular for rock gardens. The branches are quite pliable is simply pinched with fingers to avoid brown tips. These pre-bonsai Dwarf hinoki cypress are ready to be shaped and recommended for workshops. They are bushy and can be shaped into impressive bonsai during a three hour workshop. Great for club workshops or classes! Pre-bonsai– 4” pot, 12-14”– $50 Free Shipping! Great for club workshops or classes! Large image depict sample tree after wiring and repotting. Smaller image depict sample pre-bonsai before wiring and repotting. The most commonly trained hornbeam in Japan is the Loose flowering hornbeam also called Red leaf hornbeam because the new growth is bright red. During spring and summer long slender flowers form before they become tan fruit. The light grey bark has long distinctive stripes as the tree ages. The light green long leaves have distinctive prominent veins. Although mostly trained for forest bonsai, they are also used for single and multiple trunk style. This easy to grow species is difficult to locate in the United States. Create an unusual bonsai specimen. 5 trees in community pots– 10-12”– $50 Free Shipping! Click on smaller image to view community pot. Beech are a beautiful species primarily grown for their white bark, long buds and fine twigs. The dark green leaves turn bright yellow in autumn. The winter bronze leaves often persistthroughout the winter. Forest bonsai are commonly createdwith beech because they are easy to grow. These five branched seedlings can quickly be created into a forest bonsai and have been grown in a community pot. Trunks become white in about six years. The trained pre-bonsai have light branching and often smaller foliage than Japanese beech. 5 trees in community pots– 10-14”– $50 SOLD OUT! Larger image depicts a deleloped bonsai forest, ceramic pot not included. Smaller image depict sample community pot and pre-bonsai. The Buttercup winterhazel has full fat yellow buds from late winter to early spring. which contrasts with the light grey bark.The pendulous flowers are much smaller than the common Spike winterhazel. They are often trained into single or multipletrunk style bonsai. Small shohin bonsai can also be trained because of its delicate growth habit and small flower size. They have a spreading growth habit and are well rooted ready for shaping and Training. Full of plump flower buds. 1 seedling– 4” pot, 8-10” $30 Free Shipping! The Chinese Quince, “King of Fruiting Bonsai” is a distinctive species because of its attractive delicate pink flowers in early spring and large fruit during the summer. In autumn the fragrant fruit mature to a golden yellow and the foliage turns bright orange and red. Irregular patches of colorful bark can be best appreciated in the winter. All plants are seedlings from one of our bonsai and have excellent roots. The tall trunks can easily be wired into interesting shapes or created into a forest bonsai. Chinese quince has it all– flowers, fruit, bark and autumn color. 3 seedling– 2” pot, 8-12” _ $35 Free Shipping! ’The Akebono flowering cherry has fragrant dark pink single flowers in clusters. Small red fruit are produced in summer. The bright delicate colored flowers make this Japanese flowering cherry popular for spring appreciation. The new leaves are bronze turning dark green. Autumn brings colorful red and copper colored foliage. When leaves drop the beautiful shiny bark can be appreciated. The plants are well established with good branching ready for wiring. Dark pink fragrant cherry blossoms welcome spring! pre-bonsai– 1 gal, 12-16”– $50 Free Shipping! Click smaller image to view Pre-Bonsai. Larger image depicts a mature bonsai, ceramic pot not included. Japanese larch are deciduous conifers. Early spring is the best time of the year to appreciate the small delicate opening buds, which look artificial. Following a summer of light green needles they will turn golden yellow in autumn before dropping, displaying beautiful twigs with large buds. Japanese larch are quite winter hardy and will not thrive in warm climates with high humidity. Trees are pliable and have been trimmed and have great branching. Brilliant spring new growth coloring! pre-bonsai– 4” pot, 10-16”– $30 Free Shipping! Larger image depicts a sample pre-bonsai wired and repotted. Smaller image depicts sample pre-bonsai. Pre-bonsai are not sold wired or potted. This hybrid Flowering cherry from England has single pink flowers with red centers. The delicate flowers appear throughout the plant, even on young branches. Autumn brings clear yellow attractive foliage. These select plants have been cutting grown in 3” pots and have been trimmed to develop branches for training into small or medium size bonsai. They are now ready for wiring and shaping into delightful bonsai. Although the trunks are heavy, they can still be wired. Great for creating shohin bonsai and can be potted directly into small bonsai pots. Enjoy a delightful pink spring flowering bonsai! Branched Pre-bonsai– from 3” pots 8-10” Tall– $35 Free Shipping. Click smaller image to view pre-bonsai wired and unwired. This choice cultivar of Satsuki azalea has beautiful pink flowers which are small, unlike other cultivars. This dwarf cultivar has small foliage which makes it superb for shohin bonsai or larger specimens as well. The compact root system is suitable for potting into bonsai containers now. These Momo No Haru satsuki azaleas have been trained for single trunk bonsai, unlike the commonly available multiple trunk plants. The flexible branches can easily be wired and shaped into bonsai forms. Enjoy a month of pink colorful blossoms. pre-bonsai– 1 gal, 8-12”– $60 Free Shipping! 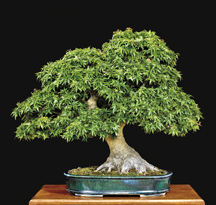 Smaller image depicts a pre-bonsai. Each album is unique and contains their own set of trees. 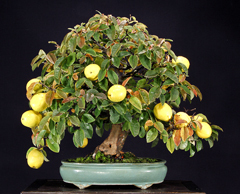 Only 5 trees have ever been shown twice at the U.S. National Bonsai Exhibition. 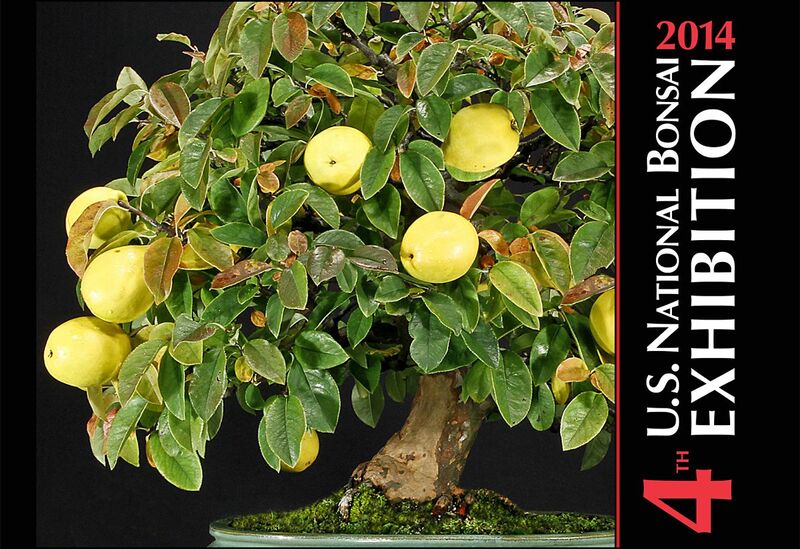 See and study over 300 of the finest bonsai in the United States displayed in the 6th U.S. National Bonsai Exhibition held on September 8-9, 2018 in Rochester, New York. 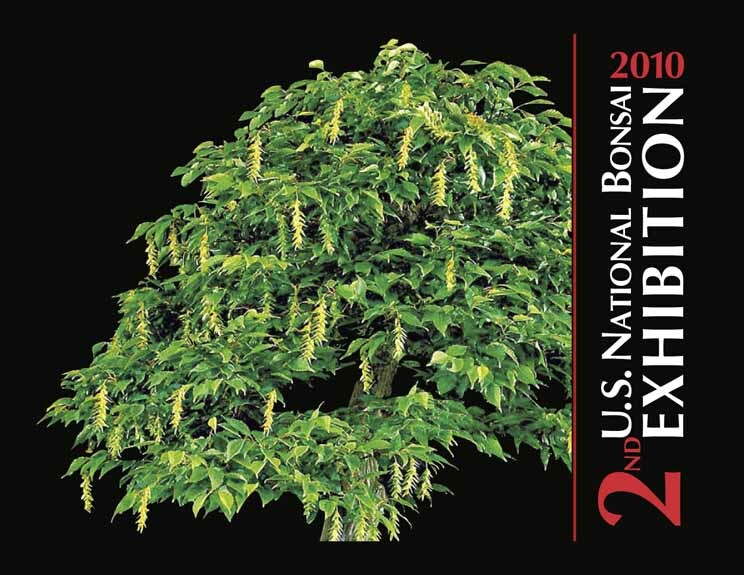 Well over 100 different species, 5 species never exhibited before at a U.S. National Exhibition, are beautifully photographed and printed in the high quality exhibition album featuring every bonsai displayed. The beauty of over 100 shohin bonsai are displayed in addition to special exhibits from the leading botanical gardens and arboretums in the country. Candid photos of the sales area and demonstrations complete this beautifully produced and horticulturally accurate book. Trees from 27 States, 11 Arboretums, Canada and Puerto Rico. Hardcover, 240 pages in full color. Not only can you view master piece Bonsai , it is a great way to study them. If you study the styles, dimensions, proportions and ratios of these beautiful trees, you will develope a better understanding of their grace. This knowledge will help you develop your own outstanding trees. Please order now and help support the publication of this great Bonsai album. See and study over 300 of the finest bonsai in the United States displayed in the 5th U.S. National Bonsai Exhibition held on September 10-11, 2016 in Rochester, New York. Over 100 different species are beautifully photographed and printed in the high quality exhibition album featuring every bonsai displayed. The beauty of over 100 shohin bonsai are displayed in addition to ten special exhibits from the leading botanical garden and arboreta in the country. Candid photos of the sales area and demonstrations complete this beautifully produced and horticulturally accurate book. Trees from 37 States. Every Album is unique, with it's own set of trees. See and study 320 of the finest bonsai in the United states, including 40 shohin bonsai compositions with 120 small size bonsai, displayed in the 4th US National Bonsai Exhibition held on September 13-14, 2014 in Rochester, New York. Over 125 species and plant cultivars were displayed which is representative of the trees trained for bonsai in our country. Plus, bonsai from three special exhibitor groups from two provinces of Canada. 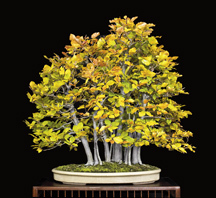 Also included are bonsai from the leading botanical gardens and arboreta in this art form. One of the earliest bonsai to enter the Untied States in 1935 was on display, which was started from a cutting taken in 1802. The exhibition was honored by Japanese dignitaries who traveled to the Untied States to see the U.S. National Bonsai Exhibition. Jiro Fukuda, Chairman of the Nippon Bonsai Association and Chairman of the World Bonsai Friendship Federation together with Mrs. Naemi Iwasaki, Vice-chairman of WBFF and Hatsuji Kato an advisor to WBFF came as well asother Japanese representative Mr. Fukuda speaking of the exhibition said " the Japanese group came expecting to see beautiful bonsai but were surprised to see outstanding bonsai." See and study 248 of the finest bonsai in the United States as displayed in the 3rd US National Bonsai Exhibition held on June 9-10, 2012 in Rochester, New York. Magnificent full color photos of each bonsai in perfect color shows fine details so you can study the forms, species and styles of each artist’s best creations. Overall candid photos of the sales area and demonstrations complete this beautifully produced and horticulturary accurate book. See and study 226 of the finest bonsai masterpieces in the United States as displayed in the 2nd U.S. National Bonsai Exhibition on June 12-13, 2010 in Rochester, New York. Magnificent full color photos of each displayed bonsai including 91 shohin bonsai, as well as candid views and three demonstrations. Relive memories from this historic event! Soon to be out of print.